Cooking for your cat is a great way to show your love, and it can be fun too. Cat expert, Wendy Nan Rees, offers advice on making a delicious sardine-loaf recipe your feline friend will appreciate. I am very often asked cooking questions when people have concerns. Recently, a woman wrote to me and mentioned that she had heard that cats can become addicted to tuna fish, and had I ever heard of that? I had, and decided to provide you with some of the reasons you don't want to feed your cats too much tuna fish in case you run into this very issue. The term for a cat addicted to tuna fish is: "tuna fish junky", and it can be a very real problem for a cat. Cats that have become addicted to tuna fish will turn away all other offers of food. Not only that, they can also become aggressive or nervous. While cats love all things fish, it is not advisable to feed only fish because your kitty won't get a balanced diet from a menu that is solely comprised of fish. Cats can even develop health problems and nutrient deficiencies from only feeding a diet of fish. Raw or under cooked fish contains the enzyme called thiaminase that can actually destroy the thiamin in your cat's system. This can lead to a deficiency of thiamin that in turn can cause neurological problems. Not only that, but feeding a diet solely comprised of tuna fish can lead to a serious Vitamin E deficiency. This can lead to a health problem known as "steatitis". This condition is also known as "Yellow Fat Disease", and it can be very painful. It causes the fat in a cat's body to harden. 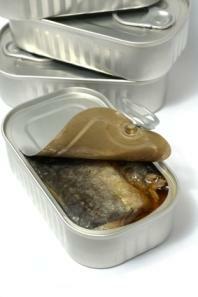 Tuna fish is also high in mineral salts, that can lead to bladder stones over time. Although you shouldn't feed fish as a regular diet to your cat, this wonderful recipe contains no tuna yet doesn't deprive cats of their craving for fish, and they will love it. I can guarantee that cats will love this week's offering, which is not only good tasting for your finicky feline friends, it is also very healthy for them too. This recipe provides Omega 3 and Omega 6 oils from the fish, calcium from the milk, protein from the eggs, Vitamin A and the amino acid Taurine from the carrots, and fresh breath from the parsley. The tomato sauce from the sardines supplies Lycopene, which is good for the heart. Fold in the egg whites, and pour mixture into a well-greased baking dish or loaf pan. Bake for 45 to 50 minutes. After removing the pan from the oven, let rest for 10 minutes before turning out on a platter or plate. Let it cool before slicing and serving.